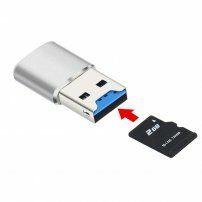 Super Compact USB 3.0 Micro SD / SDXC / SDHC / UHS-I TF Card Reader for Windows, Mac, Linux [USB005976] : Onchee.com - the accessory shop for all your handheld Electronics! With a gross color case accented by a bright color band and smooth rounded edges, the mini card reader is attractive, compact and portable. Its simple streamlined design includes a convenient built-in USB connector that allows quick, hassle-free data transfer rates. Just plug this card reader directly into any USB 2.0 or USB 3.0 port to get the most out of your memory card. - USB 3.0 card reader can easily read almost all your memory cards with speed and convenience. - No Memory card included.